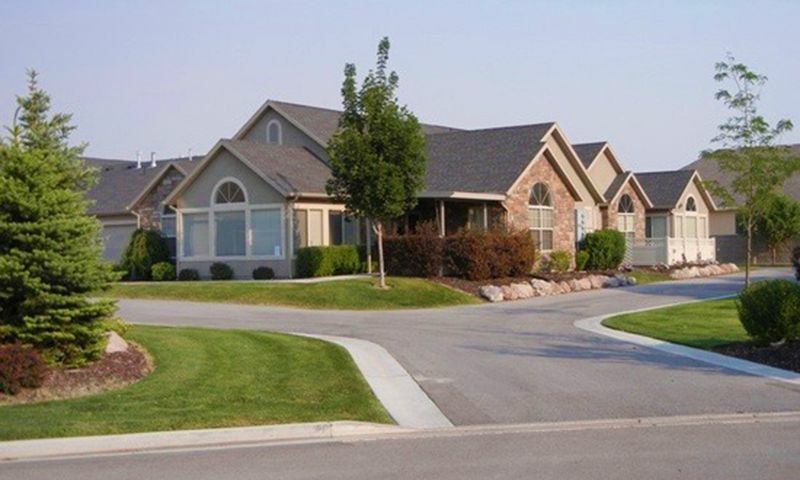 Willow Park Villas is a 55+ community in Lehi, Utah. This active adult neighborhood features 96 maintenance-free homes in a quiet close-knit setting. Residents spend their days in Willow Park Villas as they wish. They have access to a charming clubhouse with indoor and outdoor amenities to keep them physically active. There are also plenty of social activities that allow them to mingle with neighbors. Homeowners have easy access to everyday conveniences as well as great options for entertainment in the Salt Lake City area. Homeowners of Willow Park Villas gather at the well-appointed clubhouse. Here, active adults can meet in the social room for informal functions or work out in the exercise room to get fit. A catering kitchen comes in handy when preparing a meal for a club meeting or event. Neighbors can meet in the theater for some great entertainment or they can play billiards for fun. The library is a quiet space to sit and read the latest novel. Residents can enjoy the outdoors by taking a dip in the pool or relaxing on the patio. Willow Park Villas consists of 96 attached villas in quad buildings with one-level living. These low-maintenance homes range in size from approximately 1,300 to 1,875 square feet. They have two to four bedrooms, one-and-a-half to three bathrooms, and an attached two-car garage. Attached villas typically feature nine-foot ceilings, custom cabinets and countertops, covered patios, and spacious layouts. Residents don't have to worry about tedious exterior home maintenance thanks to an established homeowners' association (HOA). An affordable HOA fee includes structural insurance, landscape, snow removal, pest control, and access to amenities. Thanks to an HOA taking care of yard work, homeowners have more time to pursue hobbies and fun activities. There is plenty to keep residents entertained at Willow Park Villas. This vibrant 55+ community hosts movie nights, bingo nights, holiday parties, game nights, community dinners, and yard sales. They can join an aerobics class, water aerobics, or chair yoga class to stay healthy. They can also mingle with friends at a private party or plan a trip outside of the community with neighbors. Homeowners can choose to be as active as they want to be in Willow Park Villas. Ideally situated in Utah County, residents are never far from everyday necessities and local attractions. Just outside of the community's entrance is Highway 73, which makes driving around town easy. A gas station, convenience store, and fast food restaurant is just across the main street. Outdoor lovers will delight in the natural park space available just a few miles from their home such as Utah Lake, Saratoga Springs, Jordan River, Jordan Willows Park, and Sommerset Small Park. Big-city entertainment and an international airpot can all be found in Salt Lake City, which is about 40 minutes away. Willow Park Villas is a charming 55+ community offering maintenance-free homes within a small-town atmosphere in Lehi, Utah. There are plenty of activities available in Willow Park Villas. Here is a sample of some of the clubs, activities and classes offered here. Willow Park Villas consists of 96 attached villas in quad buildings. These low-maintenance homes range in size from approximately 1,300 to 1,875 square feet. They have two to four bedrooms, one-and-a-half to three bathrooms, and an attached two-car garage. Attached villas typically feature nine-foot ceilings, custom cabinets and countertops, covered patios, and spacious layouts. Please Note: Floor plans are not available at this time. 55places.com is not affiliated with the developer(s) or homeowners association of Willow Park Villas. The information you submit is distributed to a 55places.com Partner Agent, who is a licensed real estate agent. The information regarding Willow Park Villas has not been verified or approved by the developer or homeowners association. Please verify all information prior to purchasing. 55places.com is not responsible for any errors regarding the information displayed on this website.